3rd time buyer and very happy! We have a 4-door 4x4 truck with hemi. We first purchased Dodge`s in 1991 and will never purchase any other brand. They are the most reliable, well built trucks we have ever owned. We've had zero problems and we use it for hauling tractors, trailers, mudding, going to our cabin in the Sierra Nevada mountains, and everyday use. A shopping trip is a minimum of 15 miles one way...we live in the country. The interior is still like new with a few dog hairs, we rescue animals. We couldn't be happier with our truck! The truck has been fairly reliable over the past several years that I have owned it. I bought it used at 60, 000 miles and it now has around 120, 000 miles. The only real major expense that I have had with it was replacing the rear end. I am not sure if this is common or not. Other than that it has just been regular maintenance. I have a basic model, but it is comfortable on the inside with a lot of room and a smooth ride. Dodge is better than everything! I love my truck. It drives good, has lots of power very roomy on the inside. It's getting some age on it so a few problems have come up like some sensors going out, nothing more that a couple bucks to fix. There was a recall on the airbags, which my local dealership messed up and now I have a warning light that won't go off, and they refuse to fix b/c it'll cost them like $500. But other than that it's all good. 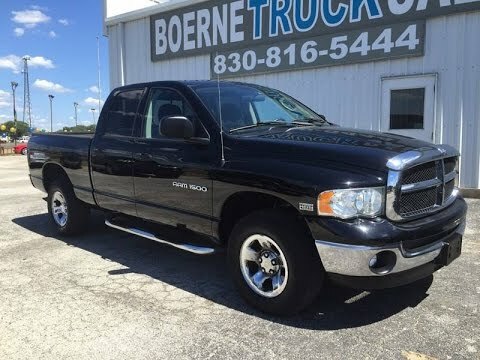 2004 DODGE RAM!! Test Drive &amp; REVIEW!!!!! On certain pickup trucks, the transfer case to transmission attaching fasteners may not be tightened correctly. This could cause the transmission adapter or transfer case housing to crack and leak fluid. Continued operation can result in propeller shaft separation and damage to fuel system components, which could lead to a fuel leak. Fluid and/or fuel leakage in the presence of an ignition source can cause an underbody fire. Dealers will retighten the transfer case to transmission fasteners. The manufacturer has reported that owner notification began on December 22, 2003. Owners may contact DaimlerChrysler at 1-800-992-1997. Certain pickup trucks fail to conform to the requirements of Federal Motor Vehicle Safety Standard No. 120, "Tire Selection and Rims for Vehicles other than Passenger Cars." The vehicle certification label lists incorrect tire, wheel, and recommended inflation pressure information. Owners will be provided with vehicle certification label overlays containing corrected information relative to vehicle tire and rim size, and recommended inflation pressure. The manufacturer has reported that owner notification began on May 5, 2004. Owners may contact DaimlerChrysler at 1-800-853-1403.